The geography of services is no longer of local or national significance: it now embraces the international stage. Service industries have enabled, and themselves become participants in, world trade. Although this is not a new role, during the 1980s they have become a much more active ingredient in the process of social and economic change. New and diversified service products have generated increased consumption, ranging from tourism and leisure, to sophisticated innovations in ways of making finance capital available for corporate growth or production strategies. But there are spatial variations between the world's nations, regions and cities that ensure a highly uneven ability to supply services, and to generate demand. There are contrasts between the developed, less-developed, and post-socialist economies of Eastern Europe, for example, and between major metropolitan areas around the globe in the extent to which they experience the positive (as well as negative) effects of the internationalization of the service economy. 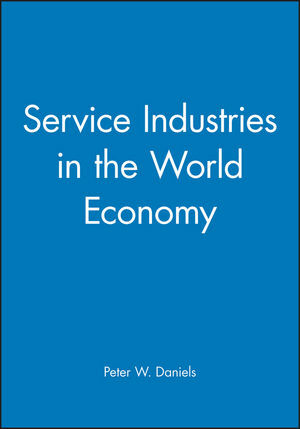 This book examines some explanations for the expanding role of services in the world economy. It is suggested that the resulting patterns are particularly significant for the form and function of the global urban system. The book concludes by reflecting on the future role of services in the world economy: can the trends evident for the 1980s be assumed to shape the evolving geography of services during the 1990s and beyond? P. W. Daniels is Professor of Geography at the University of Birmingham, UK, and was formerly Professor of Geography and Director of The Service Industries Research Centre at the University of Portsmouth, UK. He has published widely on the geography of services. 1. The Rise of Services: Some Factual and Theoretical Perspectives. The Recent Expansion of Services. Understatement of Role of Services. 2. The Tradability of Services. Information Technology and Tradability of Services. Transport Technology and the Tradability of Services. Service Multinationals and the Tradability of Services. Case Studies of the Development of Service MNE'S. Government Influences on the Tradability of Services. Changes in Consumer Requirements and Expectations. 3. International Trade and Foreign Direct Investment in Services. An Outline of Global Trade in Services. The Role of Comparative Advantage. Foreign Direct Investment in Services. International Trade in Services and the Developing Countries. Eastern Europe, the Commonwealth of Independent States and International Trade in Services. Liberalizing International Trade in Services. 4. Services and the Global System of Cities. Services and the Global Urban System: Some Explanations. Services and Cities in the Global Urban System. Services and the Global Urban System: Some Examples. 5. Internationalization of Services and Restructuring of Cities. Services and Employment Restructuring in Large Metropolitan Areas: Some Comparisons. Impacts on the Urban Property Market: Offices. Changes in the Location of Services Within Cities. 6. Services in the World Economy: Some Reflections. Services in the 1990s: Victims of the Decade of Optimism?. Is the Globalization of Services inevitable?. * Accessible survey of a key topic within urban studies and economic geography. * Pulls together a great deal of otherwise disparate information. * Accessible survey of a key topic within urban studies and economic geography. * Pulls together a great deal of otherwise disparate information.